It was pretty clear in Detective Comics #27 that the entire story took place as part of a mass-delusion across Gotham. Given everything that happens in the story, that conclusion was inevitable and is reinforced by the end of the story, when Batman is hauled away in a straitjacket because he starts to think that all might not be right with Gotham and its crime-perfectness. That’s what this new issue explores in depth, and why I liked it so much. I’ve read the tie-ins for the story, Batgirl #27 and Catwoman #27 and while I liked the former, the latter was rather terrible. There’s another tie-in, Batwing #27, but I haven’t had a chance to read that one as yet, although I’m hoping to, quite soon. The point I’m trying to make is that the entire story is quite involved from every perspective. Batgirl and Catwoman, or their “counterparts” Bluebell and Catbird appear to be central figures alongside Batman for this arc, and the fun part of this issue was seeing the relationship between Catbird and Batman, plus the relationship between Batman and his captors at Arham, plus Batman and Poison Ivy, the latter of whom is the sole person aware (for sure) that something is distinctly wrong in Gotham. Given that this is a rather short arc, only three parts in Detective Comics and the first one is just a short story, it helps that there is a lot of narration and exposition in this issue. It helps to catch up readers who might have missed out on last month’s issue and it also keeps everyone current on what’s happening. Additionally, given the huge cast for this issue, it was necessary, and I’m glad that John took the time to explain as much as possible without giving away the whole thing in the process. Gothtopia is definitely one of my favourite arcs on any of the Batman titles. There’s some great humour, and given the title of the series, it is a perfect fit given the entire mystery aspect of the story. John has said again and again that this was one of his goals for the series, to put the Detective in Detective Comics, and I’d say that he succeeds at that with this arc so far. It also helps that Gothtopia is a fun arc, with lots of great moments, especially in this issue. Frankly, there are too many to count and I can’t really say anything more without giving away spoilers, which I’m loath to do. Suffice to say, this is great stuff. Aaron Lopresti’s pencils, with Art Thibert’s inks and Blond’s colours, all continue to be great for this story. Now that we see a darker side to the entire story, what with so many scenes set in Arkham and featuring a lot of Arkhamite villains, particularly Scarecrow, Mr. Freeze, Professor Pyg and Harley Quinn, the art really becomes quite stunning in a lot of places. The contrast with the previous issue, where the art was very bright and snappy and… cheerful, could not have been greater within the context of John’s scripts. All in all, Gothtopia is turning out to be great and I agree with the sentiment in certain places that I’d love to see an animated adaptation of this story. It could be really good, I think. More Detective Comics: More Detective Comics: #19-24, #23.4, #27. 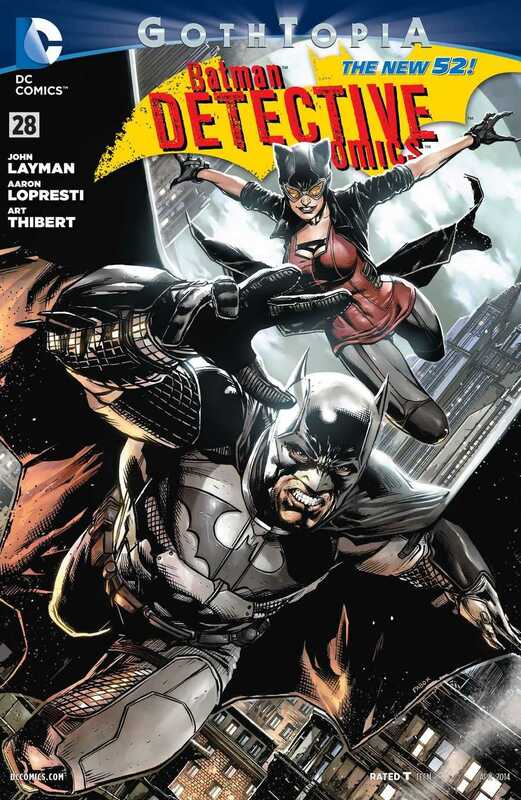 Posted on February 10, 2014, in Comics Reviews, Review Central and tagged Aaron Lopresti, Arkham Asylum, Art Thibert, Batman, Blond, Catbird, Catwoman, Comics, Comics Review, Crime, DC Comics, Detective Comics, Gotham, Gothtopia, Harley Quinn, John Layman, Mr. Freeze, New 52, Professor Pyg, Review, Review Central, Scarecrow, Superheroes, Supervillains. Bookmark the permalink. 7 Comments.